This post is sponsored by DuClaw but all opinions and the (semi-homemade) recipe are mine! I am not much of a baker. Cooking is an art and baking is a science and I’ve always been better at art than science. 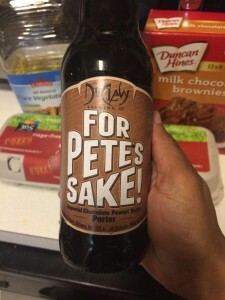 BUT I love a challenge so when DuClaw Brewing offered to send me a six pack of For Pete’s Sake and challenged me to make a fun recipe utilizing the beer, who was I to say no? 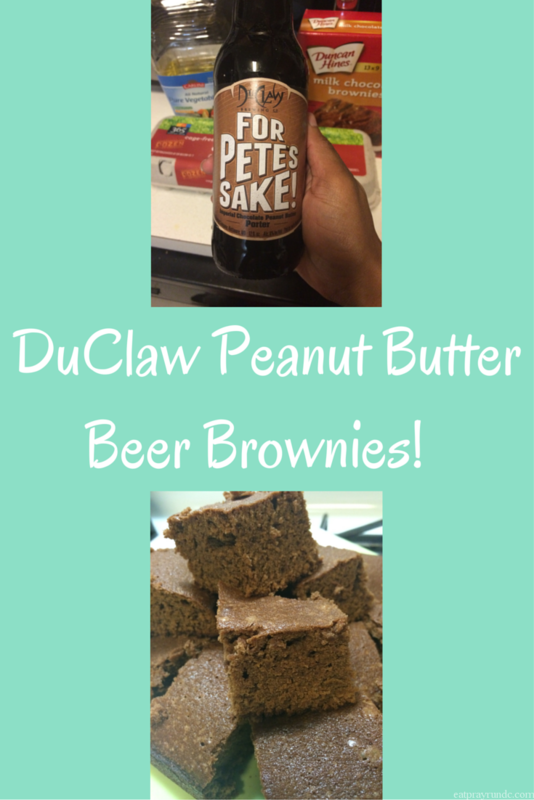 I decided that since For Pete’s Sake is a Chocolate Peanut Butter Porter, I’d make DuClaw Beer Brownies with Peanut Butter! The Imperial cousin of Sweet Baby Jesus, DuClaw has released this bigger, bolder version with more chocolate peanut butter kapow! With an ABV of 9 percent, “For Pete’s Sake” has reached a new level of silky smooth goodness, with big roasted malt flavor and subtle notes of fruit and coffee. Good until the last drop, you’ll be reaching for your next bottle to keep the indulgence going. 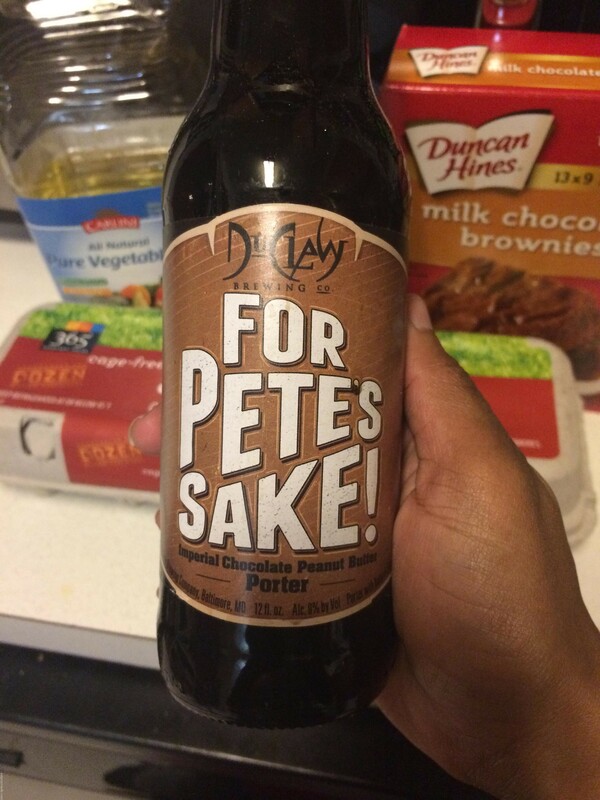 But For Pete’s Sake is only available for a limited time, so stock up at your local liquor store. I mean, hello?! Doesn’t that say “make beer brownies with peanut butter” to you? It did to me. Now, I’m going to be real honest, y’all because that’s how I roll. This is one of those semi-homemade recipes. By that I mean, I used a box mix. Gasp. I know. But you know what, it’s the holidays and like I mentioned the other day, you have got to cut yourself a break. So I did exactly that. The good news for you is that this means it’s extremely easy and customizable! These were SO tasty. Chewy and moist and with a hint of peanut butter. Honestly, I think the beer really added a lot to the flavor profile and next time I might ditch the water and just do beer and a tiny bit of vegetable oil. The beer is full and robust and the peanut butter flavor is subtle but noticeable. 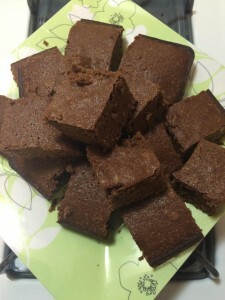 I do not foresee these brownies lasting long in our house! I’m going to try peanut butter beer cupcakes next! Have you ever baked with beer? Have you tried DuClaw’s beers? Love it! And NEVER apologize for semi-homemade… if it tastes great, you’ve won! Hahaha, thank you so much 🙂 These are REALLY good, so you are right, total win! Wow, these sound amazing! And I love that you used a mix. I’m not much of a baker and that makes it so much more likely that I’ll give these a try 🙂 Though that beer sounds great to drink on it’s own too. I’m going to have to look for it. I’ve baked with beer before and honestly I really like it. I think Guinness and chocolate are the best combination personally. These look great Courtney and thanks for sharing! Oh my gosh this sounds so freaking good! I haven’t been to DuClaw brewery in ages, but they have good beers. I can’t wait to try this! Hey, never apologize for semi-homemade! Gotta do what you gotta do! These look yummy! They are super super tasty!! Next time I’m gonna use more beer and more peanut butter! These sound so interesting. I love cooking with beer and do it often but have yet to make a sweet recipe with it. This has me inspired.